Pool huckster Alvis Seebold didn’t make any friends when he sandbagged his way into a big playoff with resident professional Tommy Crowe at Prospect’s only billiard club. 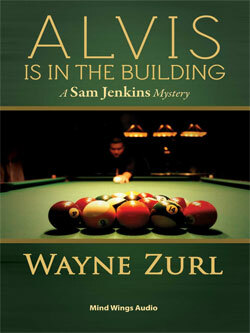 When visiting pool shark Cannonball LaShott is found stabbed to death after losing to Alvis in a major upset, Chief Sam Jenkins investigates a murder seemingly without motive. Lacking an apparent suspect, Sam looks for help from the proprietress of what he calls the best little whorehouse in Tennessee, a place patronized by the hustlers and prominent locals who would prefer to keep their recreational pursuits a secret. Like most municipalities, Prospect, Tennessee needed money. If the council voted to raise taxes, they feared a general insurrection. So, the Prospect Police Department was asked to bring in revenue through fines. That’s how Sergeant Stan Rose and I found ourselves standing at a DUI checkpoint on McTeer’s Station Pike one balmy evening in May. PO Jamey Hawkins sat in his vehicle prepared to transport drunk drivers to headquarters or pursue anyone who failed to stop at Stan’s request. There hadn’t been much traffic, but it was still early and I hoped we’d get some action. Then Stanley drew my attention. “What the hell is that?” Stanley held up his right hand, making the universal signal to stop for a policeman. A six-cell flashlight dangled from his left hand, illuminating the blacktop in front of him. I stepped next to Stanley as a candy-apple-red Cadillac with a sparkling white convertible top rolled to a stop a few feet in front of us. Stan moved to the driver’s side, I took the right and shone my flashlight into the car. Two black men sat in the front. The driver cranked down his window. The passenger looked at me and put his hands on the dashboard as if he’d been trained to do so. I spun my finger in the air, indicating I wanted his window down. “Not yet. This is a DUI checkpoint. Have you been drinking tonight?” The driver fumbled opening his lap belt and pulled a wallet from his back pocket.“Drinkin’? No, suh, ain’t touched a drop. Swear ta Jesus.” He handed a driver’s license to Stan and turned to the man in the passenger seat. I bent down and scanned the interior with my light. Spotless, white leather seats matched the top. There wasn’t a speck of dust or piece of trash to be seen. He wasn’t wearing a seat belt, so fishing out his wallet looked easy. He handed me another Louisiana license. I matched the photo to Spider’s face. He was as thin as a fishing pole and had café au lait skin, short hair with a part razor-cut into the side, and a pencil line mustache. I met Stanley in front of the Caddy and walked to his police car. “You know these guys?” Stan asked. Neither man was wanted for anything in the US or by INTERPOL. We thanked them for their cooperation and they continued down the road to find their motel rooms. After they left, we spent an otherwise uneventful night looking for drunks.